In case you’ve missed it, the extent to which the exam system has been “gamed” by schools has recently been exposed by an investigation in the Telegraph. In particular, the extent to which exam boards and examiners offer training which tips off schools about the likely content of exams, and boast about the easiness of their exams has been exposed through filming with a hidden camera. For most teachers this is less than shocking. We all know that schools play the system, and this is no different to all the other practices schools use to inflate results, such as putting kids in for worthless vocational qualifications, focussing resources on “borderline” students or the cycle of retakes used to pass modular exams. Combined with removal of material from the curriculum, and low pass marks, almost all exams have become a much devalued currency, although it hasn’t stopped denialists claiming that actually it’s just that kids are much smarter and better taught these days . 1) The examination system is not very good. 2) Exam boards should not be competing for business. I haven’t yet seen any dissent from this. It’s too obvious for words and so I’m not going to add to it. However, I have seen a few other rather annoying opinions that I think are worth highlighting. Firstly, it would be too much to hope that a lack of academic rigour in the exam system would be seen by everyone as grounds for increasing the rigour of exams. It didn’t take long for people to suggest that the problem was not that the exams weren’t testing academic knowledge properly, but the very idea that academic knowledge is the point of schooling. One Guardian journalist who presumably hasn’t been inside a classroom in a comprehensive school for 40 years declared that the real problem was that schools don’t teach “the value of motivation, persistence and self-belief“. A blog by (you guessed it) a consultant seemed to suggest that the focus on exams was a distraction from students being “fully engaged in their subject study as part of a much wider and more engaging whole curriculum, and through being resilient, adaptable, motivated and happy independent learners”. Both appear to think that the answer to a exam system which lacks academic rigour is a school system that does too. Worse, there is simply no acknowledgment that all of the above has been rammed down teachers’ throats continually for decades. The answer to manifest collapses in education standards is always more of the same type of thinking that lowered standards in the first place. Another issue raised by the scandal is one mentioned several times in this Guardian article: pressure on schools from league tables. Now whereas the above arguments for making education less academic were nonsense from start to finish, this one is more of a matter of degree. Examinations, accountability and competition between schools can be excessive. Anyone who doubts this should look at some of the horror stories Diane Ravitch has reported from America in her recent book. However, by comparison the fear of accountability in the English school system reflects little more than the dread of being found out. We know this because where schools are known to be good, which unfortunately is too often only in the private schools, they do not care about league tables. It was common for top independent schools to come bottom of the league tables by not doing GCSEs. (Have a look at the two bottom schools in Warwickshire in 2009, who’d want to go to them?) Even OFSTED was not aenough of a threat to ensure compliance from prestigious parts of the private sector. Any number of top schools were damned by OFSTED under its mad tickbox assessments. I don’t want to suggest that just because top private schools are confident enough in their reputation to ignore crazy forms of accountability then everyone can, but it does suggest that you can have a reputation for academic standards without league table confirmation and OFSTED approval by … wait for it… having academic standards. We probably do need to review the way schools are held to account, and I am glad to see that changes in the direction of academic rigour are underway, but we should not forget that if school managers are more scared of a middling league table position than of failing their pupils then that suggests a problem with their attitude and their values as much as it does a problem with the system. 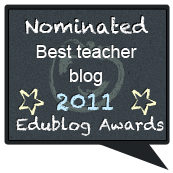 I have been nominated for the “Best Teacher Blog” in the 2011 Edublog awards. Voting closes in a day or two, so I thought I’d better bring it to your attention now. Click on the badge or follow the link here. For reasons too tedious to explain they seem to be under the impression my blog is called “Scenes from the Facilitation of Independent Learning”. Don’t let that put you off. Just follow the link, find “best teacher blog” and my blog, and vote for me, in the next 24 hours. Thanks. I’ve been exploring the same issue – the aim of education – for most of this year. Back in January, I observed that debate over teaching methods was plagued by attempts to change the aims of education to justify the method, rather than consider the method to meet the aims. My view is that while education might do all of these, they are by-products rather than aims, and each is potentially destructive if made into an explicit aim. Then I looked at what the aim of education should be and concluded that education should be about making kids smarter. I admitted that this had to be defined relative to culture and argued that this would have to include significant knowledge. I also pointed out that some of the fashionable properties of a developed intellect, such as a) understanding b) thinking skills c) creativity d) autonomy and e) inspiration, either could not be easily distinguished from the skills that come from knowledge, or where they could be they were actually not helpful. Before I leave this topic, I think it is worth noting that the debate is often phrased in different ways. In particular, distinctions are made between types of knowledge and between knowledge and skills that are used to restate traditional anti-knowledge arguments in new ways. The first way is to ask “Should we teach knowledge or skills?” I think it is clear from what I have argued above I think I have made a case in favour of knowledge. I have also critiqued quite a number of alleged skills which are taught in the place of knowledge. However, I can’t leave it at that as it is quite common for people, having set the question, to accept that knowledge is still important, but to claim that it is a false dichotomy and that we should actually be teaching both. On the face of it there is a certain amount of truth to this. We cannot avoid accepting that students should be developing skills of some description. When I endorsed the teaching of knowledge I was not endorsing rote, I was endorsing the teaching of knowledge which was to be used and understood. This can be termed as “skills”. I also accepted that there was a place for learning the arts, which again can be termed as “skills”. However, we should hesitate to accept at face value the arguments of people who say “teach both” as if they were two separate things, because they can then advocate occupying children with pointless activities or games and call it “skills-based” teaching. Knowledge versus skills is not a false dichotomy; it is a badly expressed one. The debate is better expressed as “should we teach knowledge or generic skills?” It is skills which don’t correspond to an individual discipline, but are contentless fudge, that are the enemy of knowledge. If we have to let the word “skills” into our educational vocabulary we should not let anyone be ambiguous about what they mean by it, and we should be aware that any movement based around skills, even skills with a place for knowledge, is likely to be about dumbing-down unless specifically referring to subject-relevant skills. An additional piece of jargon which can be used to obscure the debate and bring in generic skills by the back door is “deep knowledge”. It is fairly obvious that information is not much good if it is not understood, or if it is known so weakly that it cannot be applied. Fluency and understanding is absolutely vital to knowledge. If this is what is meant by “deep knowledge” then I am very happy with it. If “shallow knowledge” is used to mean rote learning then I have already endorsed deep knowledge over shallow. However, sometimes the claim is made that all methods which emphasise knowledge are “shallow” and in order to make knowledge “deep” we need to explicitly teach understanding, thinking skills, creativity, autonomy or inspiration. Again, we have the situation where it is claimed that knowledge is important, but in practice it is being sidelined. In my experience, the most important test of whether people are opposed to knowledge and content is the one of subject boundaries. Subjects are useful ways of organising knowledge, and continue to be useful until the most advanced levels of academia where inter-disciplinary work may open up new ideas. Where there is respect for knowledge there will be respect for the framework given by subjects. Those disciplines may at times run together, particularly when moving from specific examples to more general concepts, but this is something that develops from mastering those discrete disciplines, it is not a convenient starting point for study. A liberal education approached directly in terms of the disciplines will … be composed of the study of at least paradigm examples of all the various forms of knowledge. This study will be sufficiently detailed and sustained to give genuine insight so that pupils come to think in those terms, using the concepts, logic and criteria accurately in the different domains. It will then include generalisation of the particular examples used so as to show the range of understanding in the various forms. It will also include some indication of the relations between the forms where they overlap and their signficiance in the major fields of knowledge, particularly the practical fields which have been developed. However, anybody seeking to teach generic skills and sideline knowledge, will not appreciate the importance of subjects. They will seem like arbitrary divisions. Those who want to dumb down will emphasise “cross curricular links” and “thematic projects”. They will often provide frameworks for “skills”, frequently called a “taxonomy”, in which very different skills are grouped together with no respect for subject boundaries because of superficial resemblances and a hierarchy is created in which the contentless generic skills are placed higher than subject knowledge. They will also use variations on the slogan “I teach children not a subject”. What this really means is “I teach children, but what I teach them is anybody’s guess”. If anyone asks you “Do you teach your subject, or do you teach children?” I would recommend answering by saying: “I teach my subject to children”. You are currently browsing the Scenes From The Battleground blog archives for December, 2011.